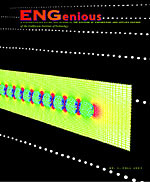 Cover image caption: Visualization of two distinct plasmonic modes in an array of twelve 10-nm silver particles. A plasmon can be pictured as a fluid compression wave in the “sea” of free electrons in a metal. The field of plasmonics studies hybrid excitations which share the characteristics of light and of electron oscillations. This unique quality allows the concentration of intense optical fields in regions much smaller than a wavelength, and therefore enables the miniaturization of optical devices to the nanoscale. Key potential applications include any area of photonics in which intense electric fields are crucial, such as nonlinear optics or sensing of very small volumes. The simulated structures (left) interact strongly with light in two frequency bands. At infrared frequencies the whole array acts like a single antenna (top array), while visible light induces an electron oscillation in each individual particle (bottom array). This is an example of how plasmonic systems allow a great deal of flexibility for engineering a specific spectral response. These simulations come from the lab of Harry A. Atwater, Howard Hughes Professor and Professor of Applied Physics and Materials Science. 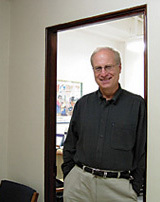 Atwater and his group are among the pioneers in photonics and in particular, were the first to experimentally show propagation in a plasmon nanoparticle antenna waveguide. Above: Actual smart skin sample demonstrating its flexibility at wrapping around a curved surface.